The Chef's Demonstration Table is a unique entertainment experience! 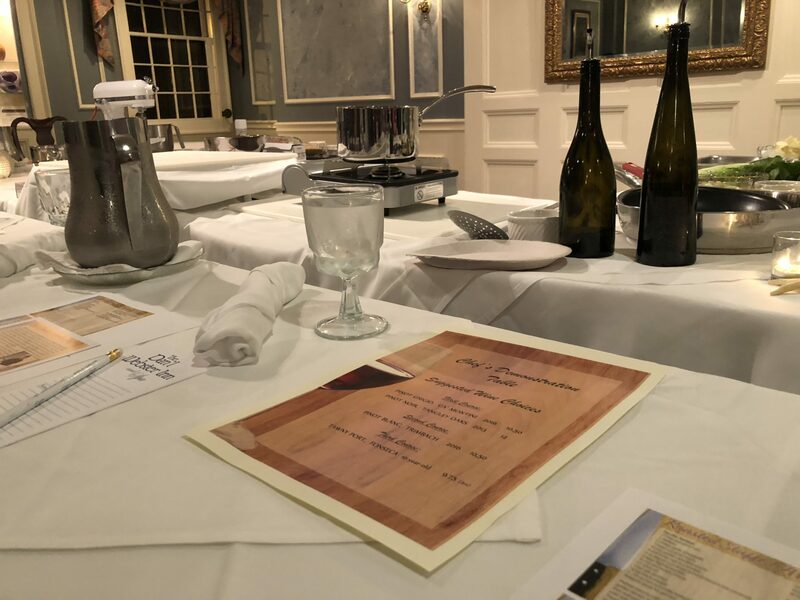 The evening was quite entertaining as about 23 of us watched Chef Steve Chausse and Pastry Chef Lydia Broderick prepare a 3 course meal from scratch. 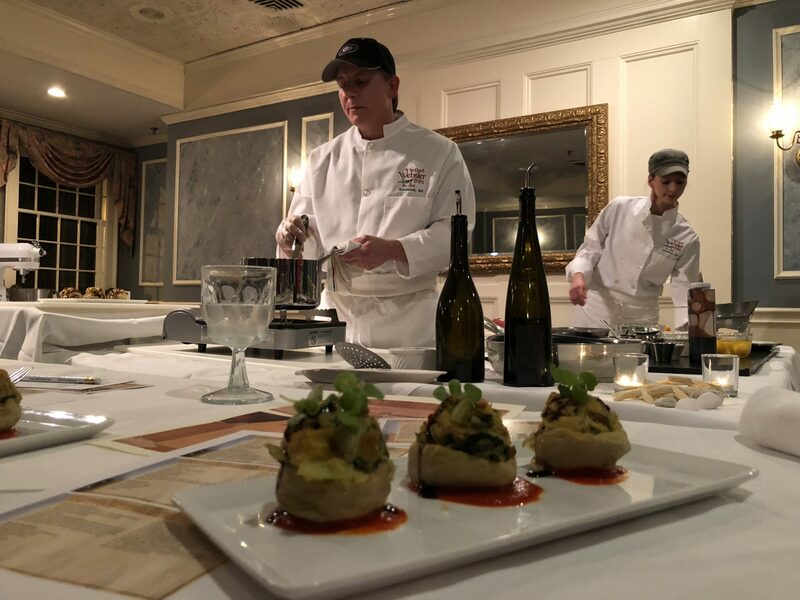 The menu included roasted Stuffed Artichoke Tartlet, Winter Flounder Francaise with a beurre blanc sauce and a Ricotta Cheesecake with an almond crust for dessert. The two chefs made all three dishes from scratch all while providing tips on which tools and materials are best to use and lots of other practical tips that we will be able to use at home. After each presentation, the finished product was served to the guests, so we ate as the chefs moved on to the next menu item. We started with the Roasted Stuffed Artichoke Tartlets. They were phenomenal. The entree for the evening was Winter Flounder Francaise with a beurre blanc sauce. It was out of this world. Chef Lydia made a Ricotta Cheesecake with almond crust. I’m not kidding when I say that it was the best cheesecake I’ve ever had. If you know me, you know that I rave about the cheesecake at Magnolia’s Bakery in NYC, but Lydia blew Magnolia’s out of the water. The setting was casual and both Steve and Lydia encouraged people to ask questions and interact. 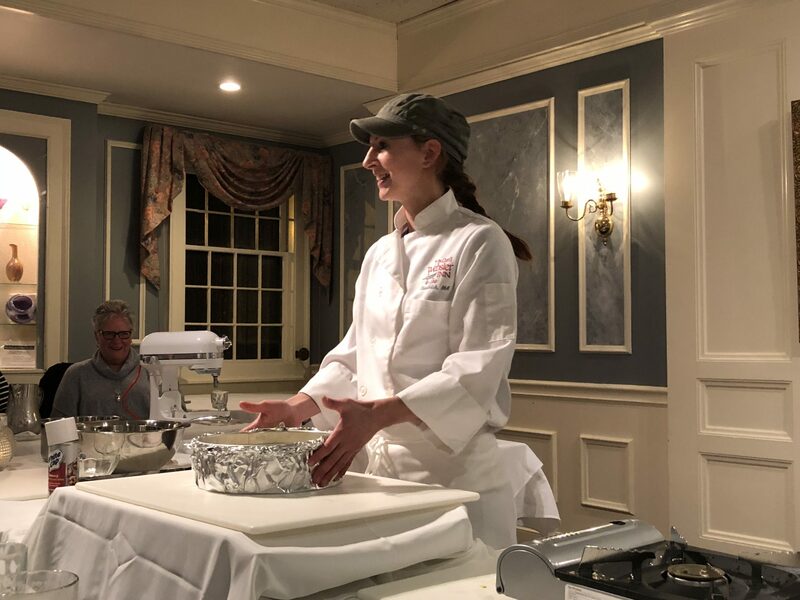 Both chefs not only taught us helpful cooking tips and tricks, but also shared entertaining stories from behind the scenes in the kitchen of the Dan’l Webster Inn and also shared insider recommendations on where to buy certain hard to find produce. 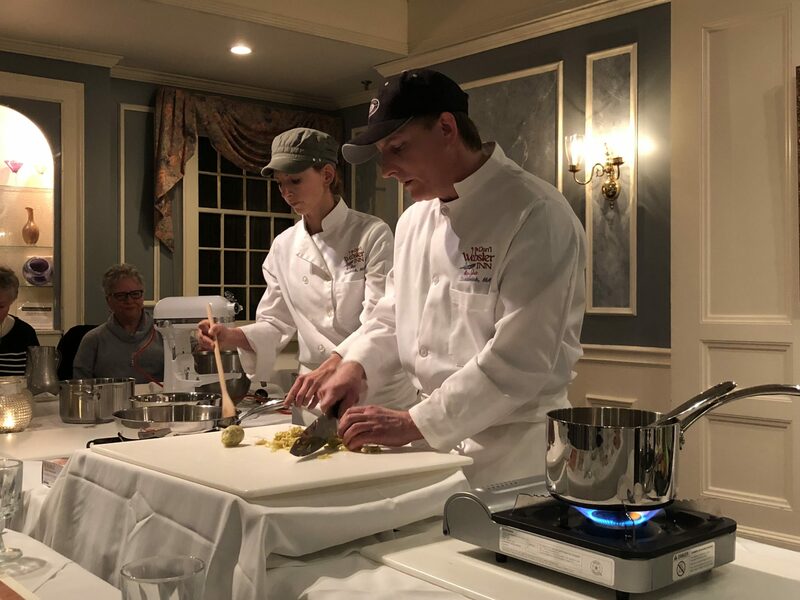 Chef Chausse and Chef Broderick have worked together for many years and it’s clear by the way they interacted with each other that they have great respect for one another and most importantly, a great working relationship. Plus, how often do you get to sit back and watch two pros do what they do best? It really is amazing to watch. 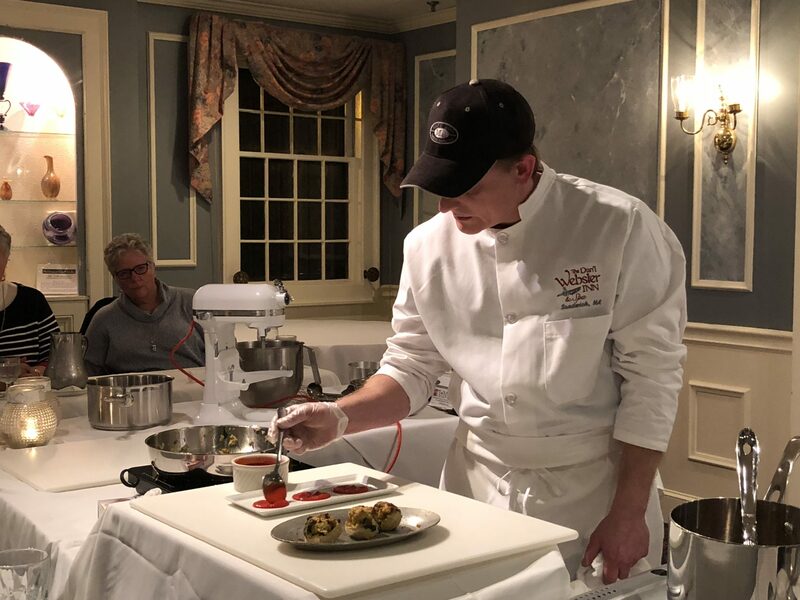 If you’re local and interested in attending one of the upcoming Chef’s Demonstration Table events at the Dan’l Webster Inn, please call to reserve your spot. As I mentioned, it’s an intimate gathering and seating is limited. Make your reservation today by calling: (508) 888-3622, ext. 248. The next two scheduled events are on February 2, 2018 and March 2, 2018. The price for one of the Chef’s Demonstration Table events is $65. That includes an hour-long cooking lesson and dinner. Guests have the opportunity to purchase specially selected wine or beers that will complement the meal. The Chef’s Demonstration Table was a fully entertaining experience and everything came together really nicely. I thought the meal was absolutely delicious and I love that everyone who attended got the recipes for the dishes presented at the Chef’s table so they can create them at home. My husband and I were really, really impressed and can’t wait to go to another one soon! If you are at the Dan’l Webster Inn for the demonstration anyways, why not make it an overnight experience? Dinner attendees are being offered overnight guest rooms at a 25% discount and not only that, attendees may purchase a $50 Beach Plum Spa certificate at a special 20% discount. *room and spa discounts may not be combined with other promotions or discounts. Subject to availability. Advance spa reservations recommended. Christian and I walked out of the dining room with full bellies and lots of stuff to talk about as we recapped our experience with each other. Spending a night at the Chef’s Demonstration Table is definitely a great way to spend a night out. What a fun date night! The Chef’s Demonstration Table sounds like such an awesome experience. I’m not a big cheesecake fan but I do enjoy the cheesecake at Magnolia’s Bakery, so to hear that this cheesecake tops it really makes me want to try it! Now this is a different kind of date night. Not sure if my husband would want to attend something like this. If he got to eat it would be okay of course. This would be so cool to experience. I LOVE to eat, so I’d be all about this. I always marvel at people who know how to cook, since I stink at it. I am a total foodie, and this place sounds totally cool! I would love to have a date night like that! So fun and entertaining. It would be so much fun to watch the chefs work, learn new tips and enjoy delicious food. This is my dream date night for sure! What a fun date night. This would be right up my alley. I love food and love cooking. The food looks phenomenal and would certainly be a change up from a regular dining experience. Looks like you and your hubby had a wonderful time. I love Chef’s Table events and watching them prepare our meals with a personal touch. Oh and that Ricotta Cheesecake sounds delicious. The Chef’s Demonstration Table looked like an amazing date night with some fabulous foods to try! The cheesecake looked delicious! And the plating! What a great experience! This is such a great idea for a little over-night date with the hubby. All these dishes look delicious. Great pictures the food looked so good and I would love to have those choices right now. I do love cheese cake so I will have to go to Magnolia’s even though you say this is better. This looks like so much fun, I’d love to do this for a date night. Everything looked so tasty! I have never done a dinner experience like this, but it definitely looks like so much fun to do. And now you have made me crave cheesecake! Now this is what I call fine dining! I would love to experience this with my husband – looks so romantic (and tasty!). Can we just talk more about that ricotta cheesecake? I love ricotta in just about everything and I wouldn’t mind having this all to myself! What a fun idea for a date night. I love this! the demonstration table is a wonderful idea. This looks like a wonderful experience! To be able to sit and watch chefs make awesome meals from scratch is so cool! I love to experience meals other prepare in front of me. This place is so local that I will need to try it out! This sounds really cool. What a great idea for a couple’s getaway or a girl’s night out! I’ve heard about demonstrations like this and I would love to go to one. The food that was prepared at your demonstration looks amazing! Oh wow what a great experience! The food looks amazing especially the cheesecake! I am a foodie and this place sounds amazing! I would love to have a date night like yours! Sitting at the chef’s table is ALWAYS the best seat in the house. Looks like you got a great show and delicious meal–jealous! What a fun date night! That is so neat that you were able to watch them prepare a meal in front of you. I think chefs are amazing! What a unique experience! This sounds like an awesome date-night. My husband is a foodie and would totally enjoy this. This is my husband and my favorite date night! We have a lot of opportunities to do them in our city, too. You had beautiful food! I honestly think this is a wonderful opportunity to enjoy good food and to learn how to prepare them as well. That cheesecake is to die for! It’s definitely something I’d love to try. Wow, all of this looks amazing and so fancy! This would be a fun date night idea, we are always trying to come up with creative things to do when we get a date night. I would like to go there for a date night with my husband, it looks very fun! This looks so fancy. I hope it tasted as good as it looks. The cheesecake looked spectacular. this looks like such a fun experience. the best part is that you get to eat at the end! Now that’s an impressive date night, chefs cooking a three course meal in your presence has to be the coolest thing ever. That was unique date night experience. I am amazed to watch seasoned chefs at work and savor their culinary masterpieces. The price is reasonable enough, considering it includes dinner and an hour long cooking lesson. What a unique way to spend date night! I would love to watch a chef cook up the meal I’m about to eat and see how they do things. I love cooking and eating so this would be a great experience! I am imagining myself on this dinner date. It is beautiful and even better that they are offering 25% off to stay the night after attending Chef’s Demonstration Table. I would love to do that if I were close by. Oh my goodness. Look at that food! Mouth watering! I would love to do something like this. It looks like a lot of fun and so yummy! I think what’s almost as much fun as eating a delicious meal is getting to see a chef demonstrate how to make it. I love having that opportunity and it looks like you were given a scrumptious dinner. This sounds awesome! My husband and I have been married for 12 years this month and honestly my most favorite date night was when we celebrated with a chef’s tasting menu at a resort. Not knowing what to expect, we had a fabulous meal! I’d love this experience. I think my husband would absolutely love this! He loves cooking and taking classes from a professional would be a dream for him! What a lovely fun date! I also want to experience like that watching how it cooked. What a lovely fun date! I also want to experience that watching how it cooked. Man I’m so jealous! It all looks absolutely delicious! I would love to attend with my husband. That’s one great demonstration indeed!